He was a farm hand. Simple as that. He worked for an elf named Berrian Amastacia, who was a kind, 459 year old wheat farmer. The hands that worked at Berrian, or Berri for short, were treated well and paid enough to live a humble, but comfortable life. Yanliz was adopted by Berri, as many of the other farm hands were, when he was found wandering the nearby fields as a child. Yanliz’s job was one of great importance, keeping the other hands protected. Since the farm was inside a clearing of a much larger forest for reasons unknown to anyone but Berri, the periodic wolf pack would stray into the farmland in desperate search of food. 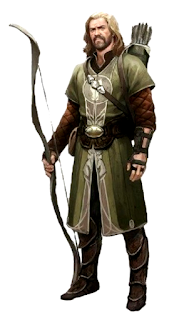 Yanliz became proficient with his longbow over the years through the instruction of Berri himself, and with his bow he would fend off the invading wolves time after time. This relatively simple life would not last. One night, a group of drow came to the farm. They demanded that Berrian come with them. Berrian sent a message to all of his defenders, including Yanliz, to prepare for a fight. One of the drow spoke the words, “Oh, I believe that will be unnecessary.” One of the hands fired a shot, beginning the confrontation. One of the drow engaged Berrian in magical combat whilst the other five engaged the defenders. The fight was incredibly one sided, as the drow slaughtered the people of the farm. Yanliz suffered several burn wounds, one incinerating his face and destroying his taste buds. He lay on the ground beneath the cover of a large tree, and suddenly, the darkness began to call to him. Not darkness as in evil, but the actual being of darkness itself. It gave him safety, it gave him a chance to fight. 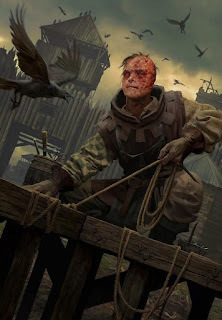 He rose and opened his horribly burned eyes to see master and friend being dominated. He fired a shot and hid. A scream of pain was heard, then confusion. He fired and hid once more. “Argh! Find it! NOW!” Scrambling of feet in all direction. He fired again and saw his foe fall to the ground. A dimension door opened and the drow who dominated Berrian was carrying him through. He fired a shot into the drow’s back. The arrow tore through the drow as he vanished along with Berrian. Fueled by rage, Yanliz killed the remaining drow, even going so far as brutalizing one with his own weapon. These were peons, and he knew it, but they were dead peons. The cover of darkness he was given made him invisible to them. Then a voice emerged, “You have tasted a small portion of my power, but this power can be obtained by one’s self. With it, the darkness will be your ally in your times of need. I retract from you my gift, and implore you to seek the gift of the darkness and stalk the creatures that stand against peace.” The immense surge of power that Yanliz had experienced diminished and left him as an ordinary boy, for the most part. With that, the 15 year old Yanliz Hayat set out, knowing that someday, it would fall to him to understand why the drow did what they had done, and it would fall to him to finish what the drow had started. Five years had past since the incident. He now lived in a cave, constantly honing his skills as a marksman and trying to understand how to utilize the power of the gloom stalker, which he’d learned through his research was the name of those who fight alongside the darkness. He wished that the being that had once contacted him in his time of dying would return to guide him, but he only received vague dreams every month on the first and fifteenth day about a silhouette of a man slowly walking towards him. His burned face was also a reason for his isolation. The burn wounds left him blind in his left eye, half deaf, and unable to taste, not to mention making him look absolutely hideous. His hearing was sharp as ever when he was on the hunt, or in battle. He couldn’t explain why, but he was thankful for this. Sometimes people would come across him, those who did ran away thinking that he was a monster. This was extremely rare, however, as he mostly remained in deep and dark parts of the cave, eating whatever he killed and drinking from a small body of water in the cave. Not being able to taste had its advantages afterall. His burnt skin, which in reality covered him from head to shoulders, was quite itchy in the beginning, but after awhile he got accustomed to it as he had drinking the water from the cave, which likely had several forms of bacteria alien to his body. Then, something that hadn’t happened in 5 years finally happened, he felt so damn lonely. So much so that he felt the urge to leave the relative safety of his cave. He knew most people would turn away from him, but he really felt like he could use help on his quest to become a gloom stalker, or at the very least he could make a friend. So, he set out for the town nearest him, taking all of his essentials in hopes of finding someone who was willing to give him the company he so desperately needed.